Act now and you can do twice as much good for the future of Shakespeare in Ithaca! A generous donor has offered to match every gift Ithaca Shakespeare receives, dollar for dollar, until the end of 2015. That means if you give a gift to Ithaca Shakespeare between now and the end of the year, it will go twice as far! This is an incredible opportunity that we can't afford to waste, but we need your help to take advantage of it. We can only go as far as you can take us! The third installment in our epic series of Shakespeare's history plays, featuring some of Shakespeare's greatest speeches and two searing battle sequences that are unlike anything else he ever wrote. The next-to-last episode in our history series is a tremendously exciting play — actually, it's three plays in one — chronicling the Wars of the Roses and featuring the first appearance of Richard III. And Twelfth Night is the pinnacle of Shakespeare's gender-bending romantic comedies, a hilarious and richly layered play revolving around a love quintangle (?? ), a drunken prankster, and his gullible victims. Just in time for Halloween, a special presentation of the spookiest, most popular, and most exciting tragedy ever written, full of witches, ghosts, daggers imaginary and real, walking forests, and two of the most complex characters that Shakespeare ever created. This is a very ambitious plan for 2016. We're expanding our season to four full-scale mainstage productions for the first time. The history plays and Macbeth are big, challenging plays, requiring large casts, intricate fight choreography, and complex special effects — all of which increase the cost of these productions. In addition, we also need to make significant upgrades to the sound system for our outdoor summer productions, to ensure that everyone in the audience can hear Shakespeare's words clearly. And we are continuing to expand our education program to offer more opportunities for children and students to experience Shakespeare's art in the most exciting possible way: by doing it! We need your help to make all this happen. ISC has grown into the largest classical theatre program in Central New York, but we are struggling to find enough funding to sustain that artistic growth. Like most theatre companies, ticket sales cover less than 50% of our expenses. The rest must come from grants and donations. And now, with this generous matching grant, we have a fantastic opportunity to enter 2016 on a more solid financial foundation than ever before. Please help us take advantage of this great opportunity! We know that giving money is never easy, and we don't ask for it lightly. But we believe that what we're doing has value for our community, and we're asking you to join us, sacrifice with us, and help us continue making Shakespeare exciting and accessible to everyone. 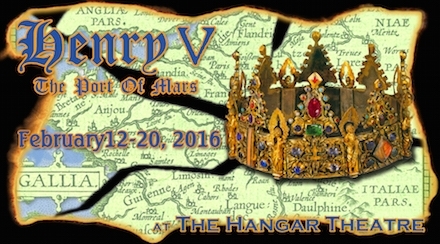 Then come see the results of our shared efforts in Henry V at the Hangar Theatre in February!